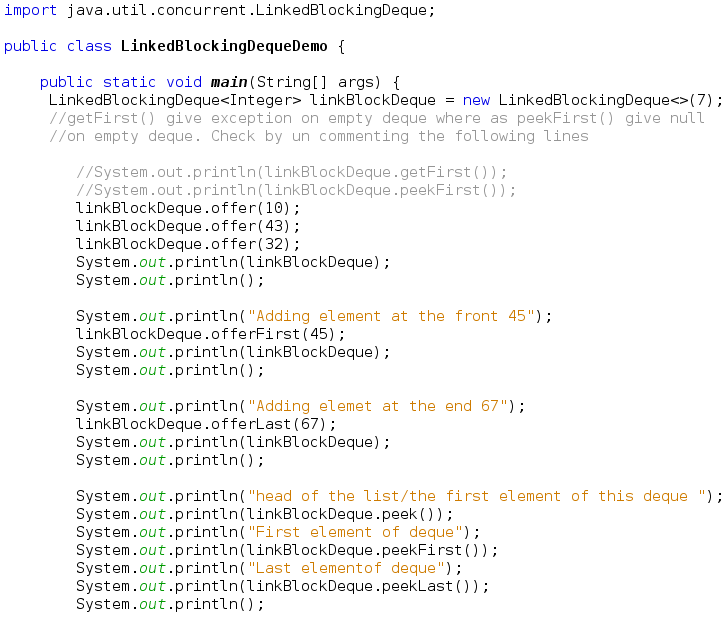 LinkedBlockingDeque implements the BlockingQueue interface. Before moving further, please a look at the BlockingQueue interface that help you better understand LinkedBlockingDeque and it's methods. 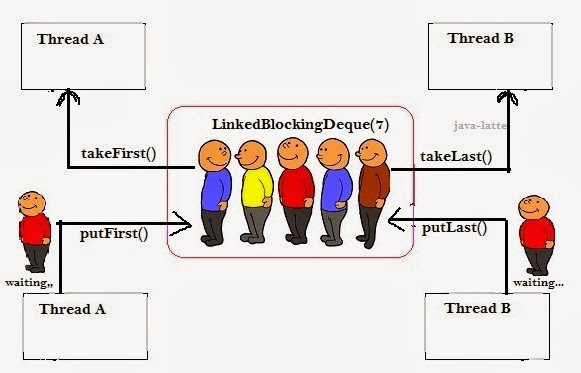 Blocking means Attempts to put an element into a full LinkedBlockingDeque will result in the operation blocking;attempts to take an element from an empty LinkedBlockingDeque will similarly block. Deque means you can insert and remove the element from both the ends. Linked means element are linked to each other and know who is in front and at the back. Optionally-bounded blocking deque based on linked nodes. Linked nodes are dynamically created upon each insertion unless this would bring the deque above capacity. Concurrent scalable optionally bounded FIFO blocking deque backed by linked nodes. 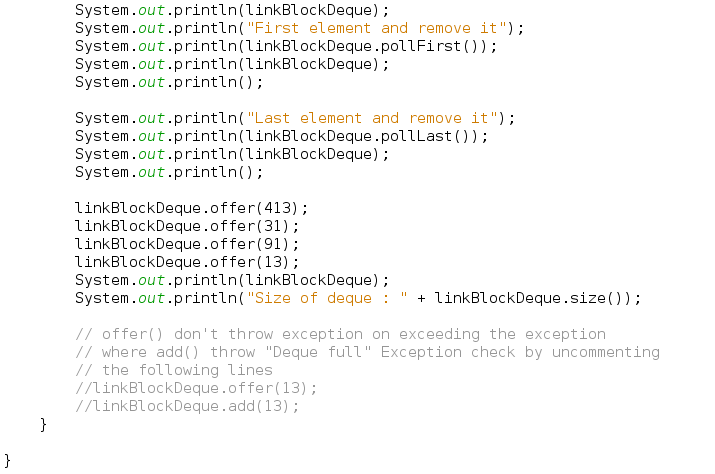 LinkedBlockingDeque() : Creates a LinkedBlockingDeque with a capacity of Integer.MAX_VALUE. LinkedBlockingDeque(int capacity) : Creates a LinkedBlockingDeque with the given (fixed) capacity. 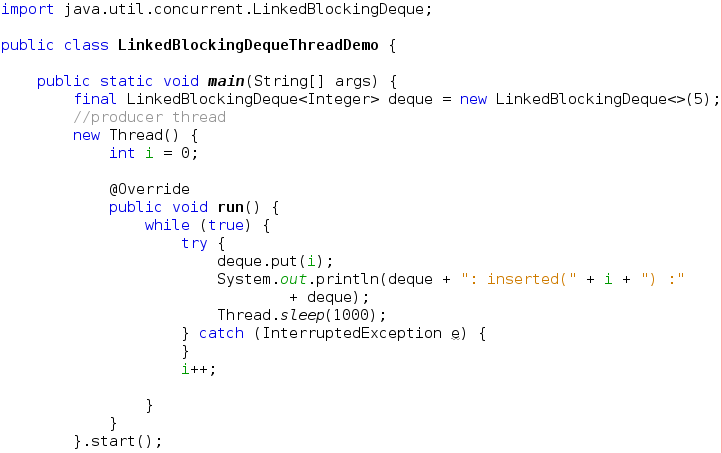 LinkedBlockingDeque(Collection<? extends E> c) : Creates a LinkedBlockingDeque with a capacity of Integer.MAX_VALUE, initially containing the elements of the given collection, added in traversal order of the collection's iterator. void addFirst(E e) Inserts the specified element at the front of this deque if it is possible to do so immediately without violating capacity restrictions, throwing an IllegalStateException if no space is currently available. E getLast() Retrieves, but does not remove, the last element of this deque. boolean offerFirst(E e) Inserts the specified element at the front of this deque if it is possible to do so immediately without violating capacity restrictions, returning true upon success and false if no space is currently available. boolean offerLast(E e) Inserts the specified element at the end of this deque if it is possible to do so immediately without violating capacity restrictions, returning true upon success and false if no space is currently available. Let see an example of usage of above methods. void put(E e) Inserts the specified element into the queue represented by this deque (in other words, at the tail of this deque), waiting if necessary for space to become available. void putFirst(E e) Inserts the specified element at the front of this deque, waiting if necessary for space to become available. void putLast(E e) Inserts the specified element at the end of this deque, waiting if necessary for space to become available. E take() Retrieves and removes the head of the queue represented by this deque (in other words, the first element of this deque), waiting if necessary until an element becomes available. E takeFirst() Retrieves and removes the first element of this deque, waiting if necessary until an element becomes available. E takeLast() Retrieves and removes the last element of this deque, waiting if necessary until an element becomes available. Have you notice from the above output that element are consumed from the head of the deque and put() wait until consumer thread consume the element from deque. Changed the method takeFirst() to takeLast(), try the above code. Sample output after changing the method name.